An embarrassment to both the national and Connecticut state Republican party leadership, Governor John G. Rowland's political career is finally circling the drain. It's difficult to maintain any kind of public support when you're facing an 18-month federal corruption probe, Bill O'Reilly is calling for you to resign, President George W. Bush excludes you from any campaigning on his behalf, and the ranking Republican in the Connecticut state Senate Judiciary Committee describes you as having exhibited an "almost pathological pattern of behavior regarding ethical lapses." Investigators allege that Rowland accepted discounted vacation rentals from a company that did business with the state, that friends and contributors helped pay for renovations of his lakeside home, that some personal attorneys -- including a judicial nominee -- had agreed to postpone billing him for their work... and then there's Enron. In 2002, Connecticut lost $220 million in what probably amounted to an illegal loan to the crooked energy monolith. After the news broke, Rowland promptly disclaimed any responsibility for the deal and claimed that he had "never spoke with", "never met", and "never shook hands with" Enron CEO Ken Lay. Later, internal Enron emails referred to a telephone conversation between Rowland and Lay on 12 October 2001. Phone records proved that the governor's office had in fact called Enron that day, in a conversation that lasted 21 minutes. And Rowland finally admitted in January 2004 that he probably did have a phone conversation with Ken Lay after all. 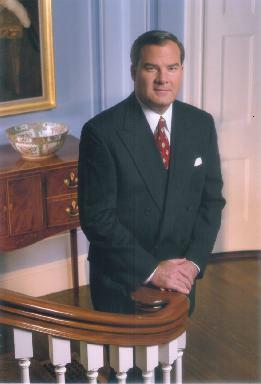 On 7 June 2004 a Connecticut Superior Court judge ruled that Governor Rowland must testify before an impeachment panel. Exactly two weeks later Rowland announced his resignation, effective 1 July. "People say, 'Oh, he's done things wrong. He's taken gifts.' Okay, let's assume half of the stuff is true. I think the more important point is, the reason I don't resign is: I haven't compromised this office. No one has even said I've compromised this office. I've not done anything inappropriate for anybody."